For the first time in 13 years, a window may be opening — albeit a narrow one — for developers to build in Prince William County’s 80,000-acre preservation area, known as the Rural Crescent. Peter Candland, Republican nominee for Gainesville District supervisor, acknowledges his election Nov. 8 in the GOP-heavy district may be a game changer for Prince William development policy. He is seeking to replace Republican Supervisor John Stirrup, a vigorous supporter of the Rural Crescent who ran for state Senate but lost in the primary. Candland’s opponent is Democrat Ann Wheeler, who signed a pledge committing to oppose development in the Rural Crescent for at least the next four years. If Candland wins, that would suggest five supervisors would at least be willing to listen to a proposal for development in the preservation area. The opportunity is unprecedented: Only one major Rural Crescent development proposal, Brookfield Homes’ 180-acre Avendale along Vint Hill and Nokesville roads, has been approved in 13 years. 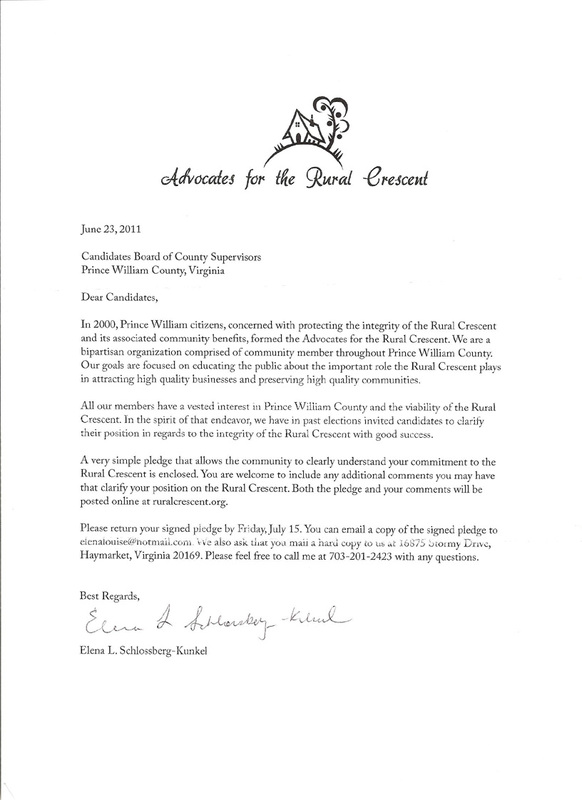 In 2000, Prince William citizens, concerned with protecting the integrity of the Rural Crescent and its associated community benefits, formed the Advocates for the Rural Crescent. 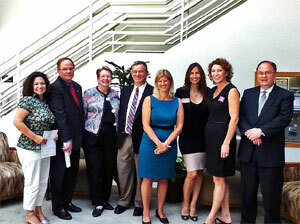 We are a bipartisan organization comprised of community members throughout Prince William County. 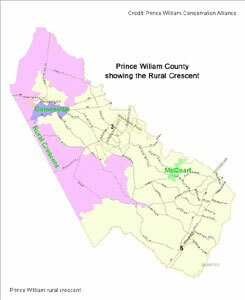 The Rural Crescent stands as Prince William County’s unique land use tool. It is not merely a means of conserving open space, but just as importantly, it is a critical tool that directs high density development to areas where infrastructure is already in place and encourages redevelopment in targeted areas, such as the Route 1 corridor. We all have a vested interest in Prince William County and the viability of the Rural Crescent. In the spirit of that endeavor, we invite all candidates – new and incumbent candidates who have honored previous pledges – to clarify their position by signing a pledge to uphold the Rural Crescent, as described in the Prince William County Comprehensive Plan. Gainesville District – Martha Hendley(R), Ann Wheeler(D), Suzanne Miller(R), Michael High (R). To honor these candidates, we will hold a press conference on August 4th, 2 pm at the McCoart Government Center, 1 County Complex, Woodridge, VA. This is an opportunity for the candidates to speak to the issue and for citizens to have chance to meet the candidates who are committed to balanced growth in Prince William County. The August 23rd primary is a critical opportunity to support balanced growth candidates. Advocates for the Rural Crescent welcomes the partnership of Prince William Citizens for Balanced Growth. The mission of Prince William Citizens for Balanced Growth is to work with local officials and citizens to balance traffic, taxes, job growth, public school, and quality-of-life issues with residential growth. The Rural Crescent plays an integral roles in all these issues. In order to protect the Rural Crescent in Prince William County, we must join together to educate everyone about the important role the Rural Crescent plays in the quality of life in the County. To that end we are organizing ARC -- Advocates for the Rural Crescent. We will be monitoring the activities of our Board of Supervisors and Virginia legislators and statewide officials and all of the agencies of government. When the time comes again for us to exercise our electoral privileges we will make sure that our leaders are those who understand the importance of balance. All of our politicians must appreciate the fact that if the Rural Crescent is compromised, the quality of life and the beauty of the Western Prince William natural environment will be lost forever. The citizens must and will demand that the Board of Supervisors uphold the Comprehensive Plan as it directly protects the Rural Crescent from developer encroachment. 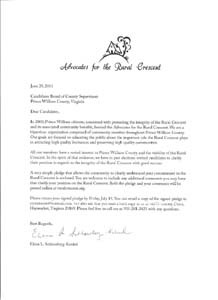 Please visit how Advocates for the Rural Crescent has been outspoken on protecting our investments in the beauty of Western Prince William County. The people possess the ultimate power and we must never become so complacent that elected officials feel safe ignoring our outrage. ARC will can be your conduit to making sure the voices of the people are heard. Together we can save the Rural Crescent. We intend to be non-partisan watch dogs that will bark at and bite both Republicans and Democrats who do not maintain the commitment to the Rural Crescent. Please join this community-building effort.